Sharks, the ocean’s top predators, renowned for their impressive hunting abilities, rely extensively on their keen sense of smell to hunt prey located miles away—earning themselves the label “swimming noses.” But a new study reveals that high levels of seawater acidity expected due to climate change can diminish their ability to track prey through sensing of odors. The smooth dogfish, a shark whose range includes the Atlantic Ocean off the eastern United States, could lose their ability to sense the smell of food due to ocean acidification if climate change continues at its current pace. Oceans absorb carbon dioxide, CO2, from the air, acting as carbon sinks, and in doing so they become more acidic. Without the ocean’s absorption capability, we would be faced with 25% more of the CO2 we spew into our atmosphere. But at the current rate of CO2 emissions, future predictions estimate that by 2100 our atmosphere will be bombarded with more than double the present-day levels of CO2. As a result, ocean acidity will rise faster than it has in a at least a million years, upsetting the delicate balance of marine ecosystems, and having largely unknown impacts on sea life. Although previous studies have looked at the effects of ocean acidity in fishes, this is the first to probe the feeding behavior of large predators such as sharks. 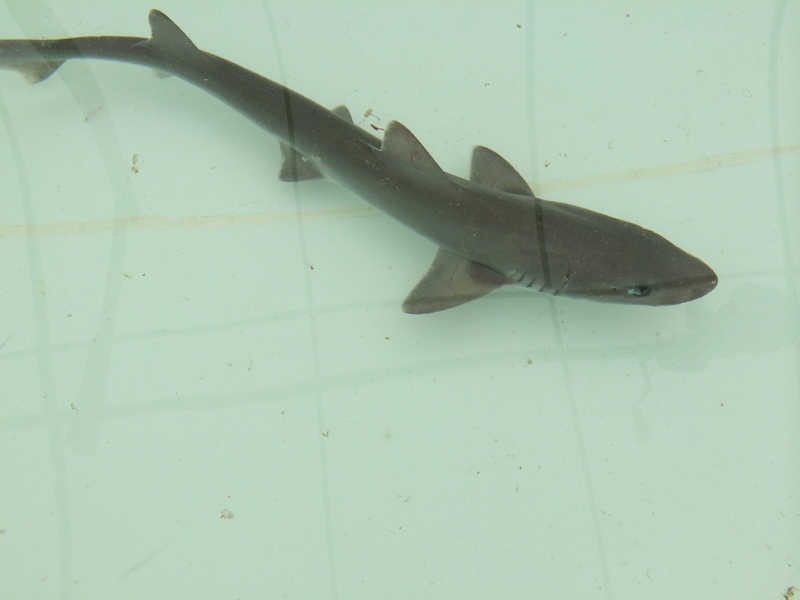 Adult smooth dogfish sharks, Mustelus canis, a small coastal species found in the western Atlantic Ocean, were chosen for the study. They are nocturnal, often found in bays and shallow waters, prowling at the bottom of the ocean at night for sick and injured prey. In these conditions, it may be hard to spot distant prey visually. Chemical cues, as opposed to visual and mechanical, tend to play a large role in detecting prey in the ocean because they travel over longer distances through currents. The new study is the first time that sharks’ ability to sense the odor of their food has been tested under conditions that simulate the acidity levels expected in the oceans by the turn of the century. The researchers placed eight sharks each into three pools with different levels of CO2: low, representing present-day conditions; moderate, reflecting levels expected in the next few decades; and high, simulating end-of-the-century projections. 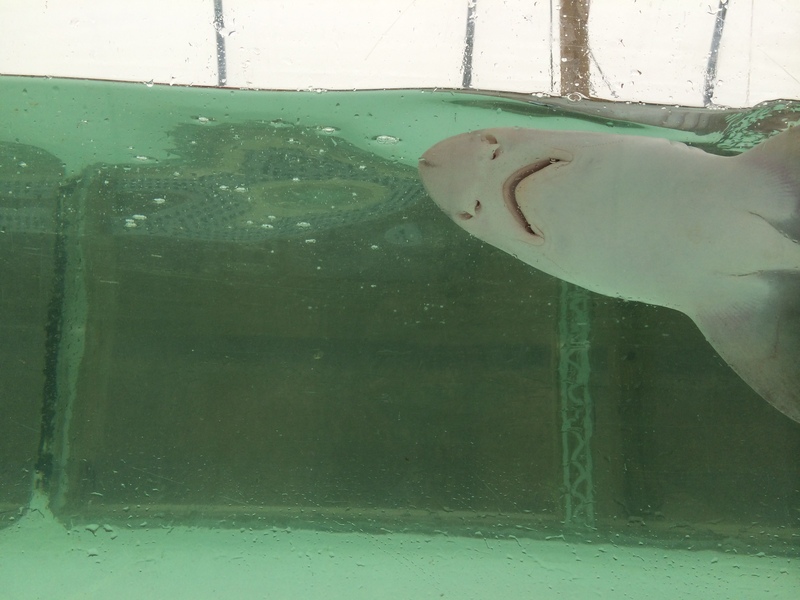 After five-days of exposure to the CO2 treatments, sharks were transferred to an odor trial flume or chamber, where they could freely choose between two plumes of dyed seawater, one with prey odor consisting of squid juice, and the other containing only seawater. They placed a brick in front of each plume as a “food” source for the shark to attack when moving towards what it perceives as prey. Each shark was tested individually in 4-min trials during which they monitored feeding behaviors, such as bumps or bites at the bricks, and how much time the shark spent near the odor source. 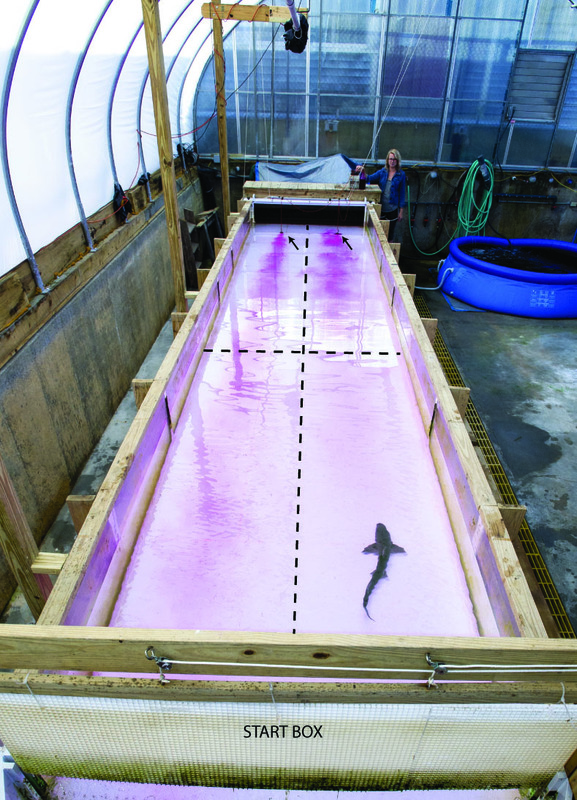 A smooth dogfish, exposed to two plumes, one with food odor and the other without, swims in a flume at Woods Hole Oceanographic Institute in Massachusetts. Arrows point to the bricks and the source of the food odor plume. Dashed lines indicate the flume sections used to determine activity level through number of lines crossed. Sharks exposed to present-day CO2 levels fared better in hunting behaviors than their elevated CO2-exposed counterparts. For both the present-day and moderate-CO2 conditions, sharks spent more than 60% of their time in the plume with the squid odor. In contrast, high CO2-exposed sharks, avoided food odor, spending less than 15% of their time near their food source, and more time in the seawater plume. Sharks from the elevated CO2 conditions also showed less frequent prey attacking behavior, whereas present-day CO2 level sharks aggressively bit on the brick and bumped against it with their snout. Unlike other studies that have mainly focused on young developing organisms, this one shows that adults are also affected by ocean acidification. Poor hunting ability can make sharks more vulnerable to fluctuations in prey availability. Since sharks are so dependent on odor sensing for tracking prey, even a small impairment in this ability can have vast implications for the health of marine ecosystems, said Prof Dixson. Smooth dogfish sharks can often be found in shallow coasts, which tend to naturally experience high CO2 levels due to upwelling—a process by which nutrient-rich water from below rises to the surface. Consequently, they may encounter high acidity levels earlier than in the open ocean. Although sharks have inhabited the Earth for around 400 million years and have been exposed to levels of CO2 higher than future projections, the current rate at which we are changing CO2 levels is unprecedented, making adaptation more difficult; and with their slow growth and low reproductive rate, the crucial question is whether they can adapt fast enough to cope. Prof Dixson cautions that the sharks were exposed to highly acidic waters for a short period of time—only five days—and so more studies are needed to assess their ability to adapt and acclimatize to the changing ocean conditions. Adapting to climate change is yet another challenge for sharks, with a quarter of the world’s species, and a third of oceanic species already threatened with extinction—mainly as a result of overfishing for their fins and meat—according to estimates by the International Union for Conservation for Nature. The next step, says Prof Dixson, is to find out if other senses are affected, and how organisms will respond to several sensory stimuli presented to them simultaneously. This entry was posted in Climate change and tagged Climate, Climate change, hunting, Ocean acidification, Odor, Predator, Prey, sharks, Smell. Bookmark the permalink. Sharks are also facing rapid decline from hunting them for their fins for sharkfin soup… perhaps this will be a self-correcting problem since very high levels of a potent neurotoxin is rapidly accumulating in shark fins. BMAA toxin is emerging as being a toxin produced in some, if not most, cyanobacteria and is accumulative up the foodchain. Seems likely that it could be causing adverse effects in the shark as well, not just in those that eat sharkfin soup. Neha is an aspiring freelance science writer. She writes about the diverse forms of life in our planet, and is particularly interested in infectious diseases.